While I was off continuing performing with The Tension Experience, tonight our guest was filmmaker Rich Newman, author of Devil in the Delta: A Ghost Hunter's Most Terrifying Case ... to Date, Ghost Hunting for Beginners: Everything You Need to Know to Get Started, The Ghost Hunter's Field Guide: Over 1000 Haunted Places You Can Experience, Cinematic Game Secrets for Creative Directors and Producers: Inspired Techniques From Industry Legends, and the subject of tonight's show: Haunted Bridges: Over 300 of America's Creepiest Crossings. When Henry referred to The Tension Experience as my performing "InTense...", Kat quickly provided the correct title and information I'd provided her. Kat read out Rich's brief bio I'd also provided. While Rich's book bundles haunted bridges by their "category:" cry-baby bridges, suicide bridges, phantom hitch-hikers, et al, but Rich, at first worried they'd all be "the same," he found there were some intriguiging and distinctive differences. Rich spoke about ghosts in taxis, as well as phantom cars. He pondered how many may be time-slips, even adding about the SS Tennessee that wrecked on one of the Golden Gate's pillars and sank, and it is still sighted. He had finished his previous book, and Amy at Llewellyn suggested haunted bridges as a subject. Kat brought up Sachs Bridge, as Kat and Henry had been there. Rich clarified that if a haunted bridge being repaired or replaced (the original Sachs Bridge was washed away by a flood, but its replacement was at the same site using the same foundation), some replaced haunted bridges are a few hundred yards away. Residual hauntings obviously stay at the original location, while intelligent ghosts often may move to the new bridge location. Rich spoke about his interviewing people for his first book, The Ghost Hunter's Field Guide: Over 1000 Haunted Places You Can Experience, and uses the same sources for the bridge book. They spoke in more depth about the Golden Gate Bridge, and suicidal residual hauntings, as well as ghostly vintage cars, etc. There's also a headless apparition that will run down the bridge when there is heavy, often stopped traffic. Some in the chat room, asked after the doomed Ashtabula Bridge in Ohio, what with its 29 December 1876 derailment disaster, which has a residual haunting at the disaster's anniversary. Rich was aware of the story, adding about the despondent, crying ghost of Charles Collins, who had been the inspector who did not notice the issue that caused the wreck. Getting into Cry-Baby Bridges, every single state, even Alaska and Hawaii, have a minimum of one Cry-Baby Bridge; in the south there are often several. Generally the story is of a baby thrown off the bridge, whether it be an unwanted baby, or the baby of someone townspeople hated/feared, and one hears a "baby" crying. Kat once investigated reported one Cry-Baby Bridge called Azalia Bridge, but while they didn;'t find any baby cries, they did find two male spirits. Rich was aware of it, and researched it, but pointed out as it was, his book could have been twice its current length. If there's a second book, it'll go in there. Kat added an aspect of which I'm well aware, that often people hearing foxes, fox kits, and even some species of owls, can be misheard as a human baby cry (as an aminal lover, I've long since known that a fox cry often sounds like a woman being murdered). Rich pointed out bobcats can also sound like a woman screaming; Ceiling Cat Barbara Duncan concured about mountain lions. Rich visited as many of the bridges in his book as possible. He spoke about Stuckey's Bridge, and his being amused it being over the comically named Chunky River. Kat brought up to Henry wanting to speak about Maud Hugh's Bridge, and his visit there years earlier. Rich clarified it being called the Screaming Bridge. Kat pointed out a bit of a Satanic aspect to the local Cincinnati area. There's also a story of the screams heard there being the engineers who'd died during a wreck. CC brought up the Clifton Virginia Bunny Man Bridge, regarding a man in a bunny suit threatening people with an axe. They even referenced the low-budget Bunnyman Massacre movie, in which my friend Maria Olsen was featured. They then discussed Concord Covered Bridge, about a school bus crashing and drowning the children therein, and how using candy as a trigger device often attracting Activity. Kat brought up Judith Road Bridge for Henry, regarding a Hell Hound like dog sighted there. CC spoke about the San Lorenzo River Trestle in Santa Cruz, filmed in The Lost Boys. Henry and Kat brought up Creek Road Bridge, in Ojai, California, which along with Bunnyman Bridge, is one of Rich's favourite bridges. Apart from a Char Man legend, there's a headless person, a bloody bridge, ghostly children, even a vampire. Apparently the whole area just Feels Weird. It was pointed out CC is too far from Ojai, but no one thought to point out it's much closer to my area (less than 80 miles away), my having been to Ojai, albeit years earlier, long before knowing of anything paranormal there. After giving out his information, listed below (even more than he provided on the air), Kat gave out her and the show's information and less than a truncated reference to my sites, all listed below. Rich was a brilliant guest, and we certainly hope to have him back. Henry wrapped out as he conveyed our guest next week would be Ann Bridges author of Spirit Magnet in Texas. 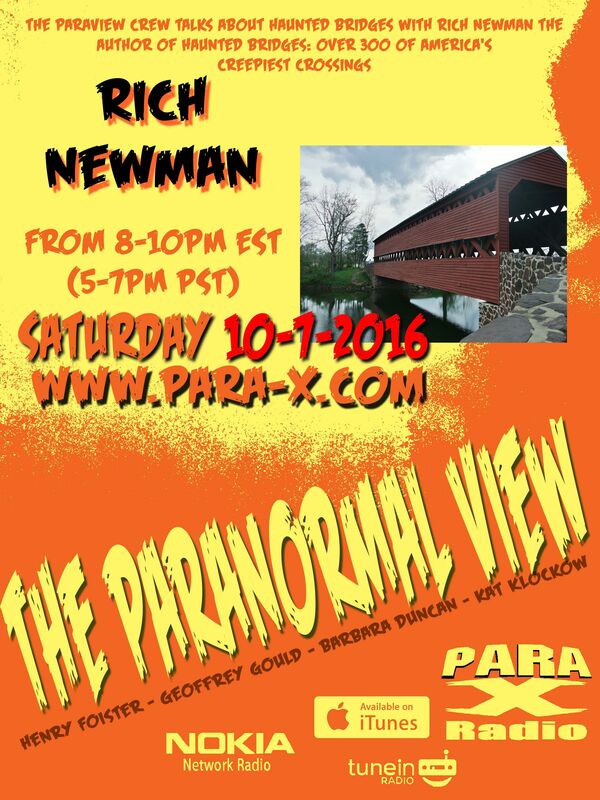 Author Rich Newman on 08 October 2016 edition of The Paranormal View.